At last, a working extruder. I noticed that the block from which the hot end hangs is asymmetric both left to right and front to back. Out of the box it was assembled so that the filament would be fed into it if the hole seen from above (pic 1) is directly below the left filament hole. I thought I could switch it around to use the right filament hole, as in the instructions. But this doesn't work: it will only work with the left filament hole. I put it back to way it was originally, and reversed the direction of the extruder motor, and after some clunking and whirring and complaining, filament came through. Pic 2 shows it from the side, proving the filament is going where it should, and pic 3 is the squiggly mess from putting 100mm of filament through. (I know this isn't very exciting, but for me it's a breakthrough). @unshockable, try measuring the resistance across the screw terminals on the RAMPS that your extruder heater wires attach to. You should see a few ohms (2-4). If you see infinity, then either you aren't making contact in the screw block or there's a broken wire or the heating coil in the hot end is broken. If you see zero, there's a short circuit somewhere. @unshockable, try measuring the resistance across the screw terminals. You should see a few ohms (2-4). .
3.6Ω, standard heating coil resistance. Note that there's never any voltage across the extruder heating pins. There's also a light for the bed heater. Is there a light for the extruder heater? Edited 1 time(s). Last edit at 06/15/2015 09:42PM by Unshockable. This shows a LED. Have you checked for 12V coming in? Obvious, I know, but we've all had our moments of measuring the noise. Failing that, I'd vote for a failed MOSFET on the RAMPS board. I'm sure I did, but I'll double-check. Yep, 12V is coming in for sure, all pins are active on the green connector. I don't see an LED cycling anywhere on the board beside the bed indicator. The LED on the far bottom right and the one on the bottom of the board below the 55NF06s remain unlit. Sorry, after resetting the board, the green LED at the bottom flashes twice. Edited 1 time(s). Last edit at 06/16/2015 01:45AM by Unshockable. Success!! I printed a 10mm calibration cube (http://www.thingiverse.com/thing:667281) and here it is (https://goo.gl/photos/Gv8T4RPxkmQn9TRaA). The X and Y dimensions are quite accurate, at about 10.5mm. The top collapsed, and I could see from when it was about 80% done that the sides were becoming uneven. Could this be due to running it too hot? The Folger setting use 219C for PLA, but Devil Inc said a few posts back that this is too high. Anyway, no time for more tonight, but this is a big step forward. It's alive! Edited 1 time(s). Last edit at 06/15/2015 11:57PM by animoose. 219C seems too high for PLA. What brand are you using? I consistently use about 200C for Hatchbox PLA, but that can even be too high in some cases. Congrats! Yep way too hot for PLA. I did the same test only a few days ago. Try 180 or 185 and you'll get much better results. Also on Folger techs Google Drive they have configuration files for pla and abs. I just tried the PLA one tonight and it was pretty good. I'll post a picture in the morning. Edited 1 time(s). Last edit at 06/16/2015 12:20AM by markts. It's the sample that came with the kit, and is labelled only with FolgerTech label and no indication of the brand, and I used the PLA config file downloaded from their site. I will try a cooler print tomorrow. I also have some "JET by American Instrument" (this one) which I'll try when I've used up the sample. This is my first printer and I'm gradually getting the hang of it. Managed to make my first successful print today out of PLA. I was surprised it worked after so many jams and failed prints. My hotend assembly is already shot after being taken apart so many times. The cold end threads are stripped and I don't even dare take the cold end out again. Both the hot end and the cold end leak terribly and require constant attention to keep drips off of the print. Here are a few questions for anyone ewho has a moment to answer. Where can I find the aluminum block that the hotend screws into. The threads in my block are shot? Is there a higher quality hotend assembly that will work with my machine? I have been hearing good things about the i3d v6. Has anyone tried this out yet? I'm not sure weather to get the 12v or the 24v direct feed model. My Y axis bearings sound terrible. Anyone know of a higher quality replacement bearing? That should do for now. Thanks in advance to anyone who answers. I pulled my machine apart after a week of running and re-lubed the bearings with white lithium grease. I found a tube of it at the local auto parts store. I know there is an aerosol can variety, but I didn't want to mess with the overspray. I've been getting a small amount of ooze leaving black spots on my prints, so I found the threaded tube was a little loose. Upon tightening it, I decided to pull it apart and clean up the oozed plastic. Threads were boogered a little, so I brought the block to work and chased them with a M6x1.0 tap. I also ran a die down the tube to clean them up. As for a replacement block, check eBay or Amazon. I don't think there is anything 'wrong' with this style hot end, as I've been printing fairly decent prints with mine. Taking the time to make sure that everything is smooth and tight before using it will go a long way. The E3D V6 is on my radar, but I think it'll wait until I expand the Z Axis some more to accommodate for the increase length. I've had a couple decent prints and some really bad ones, but now I can "mostly" get it right. Now it's time to calibrate the printer further to make my prints look like the ones I see online. I like the calibration section on the wiki here, and I'm going to follow that. Here is the thin wall calibration cube, one at at layer height of 0.4mm, one at 0.2mm. Then there's "benchy". He came out pretty good - family was impressed . There are some issues I'd like to try to address, and hopefully the wiki will give me some ideas. It may be as simple as getting a fan, as there are some places that look "goopy". I need to address the types of areas over the doors and windows - how should I expect the printer to do span spaces like that? The aluminum block should be easy to find on eBay. I just my e3d6Lite hotend in the mail yesterday. Can't wait to install it. Many people complain about the stock hotend in the acrylic thread, but I've gotten some great prints with it. I'm not sure if this has been asked before, but I have been having problems with my Z axis binding on one side and going uneven. My X whenever I hit the home button in repetier moves a little bit to the right and stops, it will also just keep ramming the endstop (the light on the endstop turns on) I have to keep hitting home to get it all the way over and then it wont accept any more commands. With all that going on... my Y axis works fine at least. Asked many times - a lot of us have had to deal with it! If you think about it, the system isn't expecting to hit the physical endstop where you've placed it so it doesn't know to stop when it hits it. Fix your X direction and/or X Home Dir and it will work. Look back a few pages on here and you'll see many of us resolving the same issue. Yea, I guess I was expecting it to cut the power to the stepper to keep it from ramming into the end stop rather than just let it... I'm still learning though. Glad I went with a kit over a prebuilt. Look on page 5 of this thread to find out what you have to edit. Save, then reload the Arduino board with the new firmware. Let us know how this goes. I've thought about upgrading to it but haven't decided. All right, I still can't extrude anything because the extruder won't heat up. When I switched the power pins for the heated bed and the extruder, the extruder will heat up, and it's detected on the temperature sensor. The display on the LCD more or less matches what's on the computer. It looks like the extruder head is fine, but there's something wrong with my board. What should I be testing here to find the failure point? Edited 1 time(s). Last edit at 06/16/2015 04:06PM by Unshockable. I really think the MOSFETs on the RAMPS board could be the problem. You've proved the extruder and the wires that go to it are good. Here's a couple of ideas but please not that this is pure speculation. I guess from previous posts that you are pretty engineering-savvy, so you can judge for yourself if you want to try them. 1. Attach the extruder to the middle set of connectors on the connector block, and figure out something in configuration.h or one of the other firmware files that will make it use this for the extruder. 2. Replace the RAMPS board. I don't remember if you've already tried this. 3. 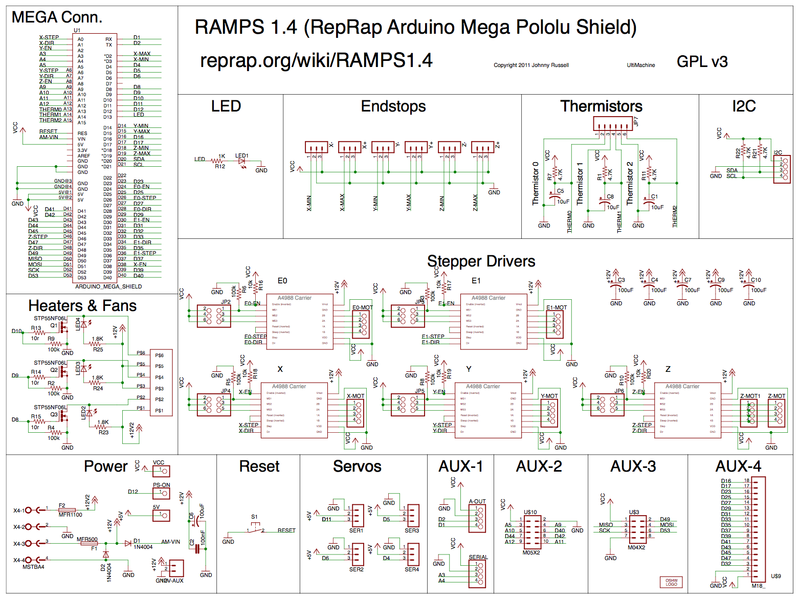 Stare hard at your RAMPS board. Maybe there is a dry joint on it. Touch each solder joint briefly with a hot iron and some fresh solder, especially the MOSFETs. 4. Desolder the MOSFET that drives the extruder and solder in a replacement, or swap it with the one that the middle set of connectors uses. Or at least put the MOSFET on a transistor tester and see if its alive. You found me out! I'm an electrical engineer. I'll try them in this order: 1, 3, 4, 2. I don't have a spare RAMPS board, and the lousy ones are $30 on Amazon. I'm in Canada, so there's a lower selection of parts. Me too, before I found that software involved less risk of things going bang. I really recommend the one I mentioned a few posts back. It was very nicely made on a visual inspection. The link is [www.amazon.com] and in the US at least you can get it on fast delivery. Good luck! Wow, lots of EE's here (also into software). Must be that we're at the cusp of these things becoming mainstream but it still takes an engineering mind to get them going. Heh, I was a military contractor for several years. Things were SUPPOSED to go bang. Admittedly it's been a while since I've done any firmware work, but hey, the kit is pretty friendly to use. It's usually not worth shipping things to Canada. Exchange notwithstanding, the times and fees are pretty high. I'd end up paying... probably close to $65 CDN by the time that board got here. Hi all, I managed to finish putting my printer together and made it to the config portion about extruding. I have my E motor set to 0.317 and it just makes a binding noise. It won't grab the filament and pull it in, it just kinda vibrates. The only way I have been able to get the filament down to the heater block was by pushing it. Is there anything I can do to fix it? Looks like my last post got swallowed, so I'll try again. Here's today's prints. I know they aren't much to look at, but to me this is pretty exciting. Second: 20x20x10x0.5mm thin wall test at 190C. Wah wah. Then again at 180C. Much better apart from a little separation in the top half. animoose, with the 10C temp difference I don't think you should have that much difference in print quality. Have you taken a trip through this calibration guide? Edited 1 time(s). Last edit at 06/17/2015 08:25AM by Devil Inc. Anyone find a good fan duct to print to let you blow air onto the part being printed? I see a bunch, but I don't see how they attach to the head. I've tried a few, still trying more as I get my printed tuned better. Most of the i3 compatible ones I've seen, you take the heatsink and press it into the duct and then put the extruder back together the same way you took it apart.